The other day, during an increasingly rare fit of boredom, I decided I was going to re-organize my collection. 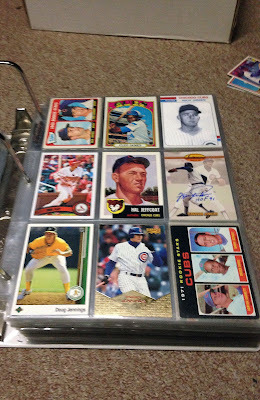 Excepting my bindered, declared collections (the roster collections, minor league, etc. 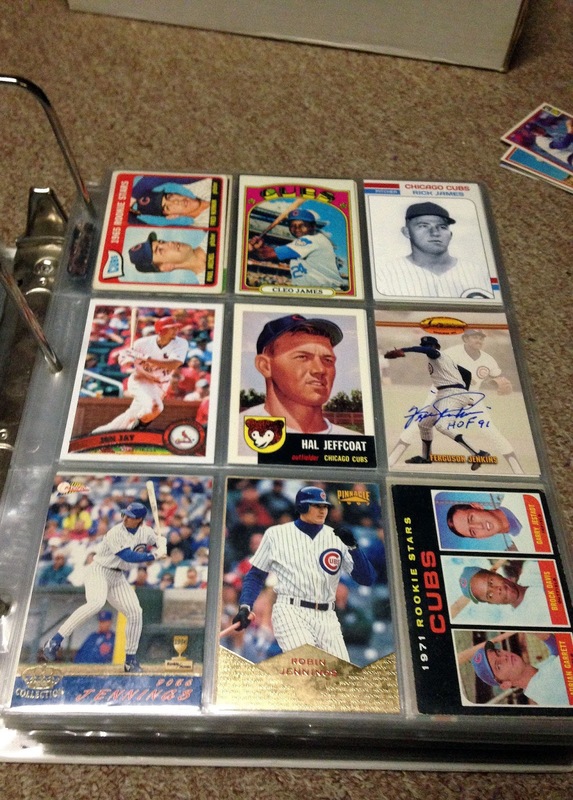 ), I emptied my miscellaneous Cubs cards box and decided to sort the endless varieties of cards by player last name. 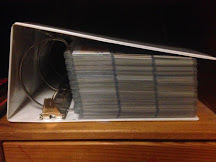 Previously, they had been stashed in there all willy-nilly, as they came into my possession and without even the slightest hint of organization. Obviously, that made finding things quite difficult. Mid-90's Pacific baseball cards are fairly significant on their own, although this 1994 Crown Collection single hails from the time just before their set designers started dropping acid. The card design, though much simpler, is quite visually appealing to this Windy City fan. The elegant, blue marble nameplate makes for a perfect frame on a Cubs card. Furthermore, the photo may be otherwise pedestrian, but the fact that it was snapped at Wrigley Field with the home pinstripes more than makes up for it. Anyway, setting the visuals aside, the true significance here (at least for me) is that I was completely unaware that Doug Jennings had ever had a a Cubs card issued in his honor and yet, here it is. After all, the outfielder/first-baseman played in only 42 games for the Northsiders, all during the 1993 campaign and he batted a mediocre .250 with very little power along the way. 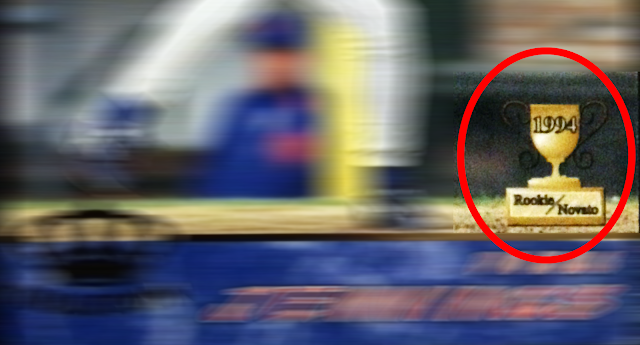 Even during the tail-end of the junk wax era, it wasn't a farfetched notion to think that Jennings might be ignored. For the longest time, I had operated under this assumption, as cursory searches turned up no contradictory information. In the place of a true Cubs card, the above '89 UD single from Doug's pre-Wrigley days in Oakland represented him in my CATRC binder, largely due to the set's iconic status and the gloriously garish, yellow A's uniform. I'm assuming that when I originally obtained the Pacific single (how, I don't recall), I knew that I'd already had a Jennings card, but didn't stop to consider the team affiliation. So, I filed it away and promptly forgot about it. Silly, lazy me. Well, Doug's representation has now changed - the banana yellow outfit goes into my newly-sorted miscellaneous Cubs box and the Cubbie blue Pacific single slides into it's vacated pocket. Cubgrade, ftw! Doug was your typical Quad-A player - you know, the type that puts up good numbers in the highest levels of the minors but can never translate that success to the Majors. 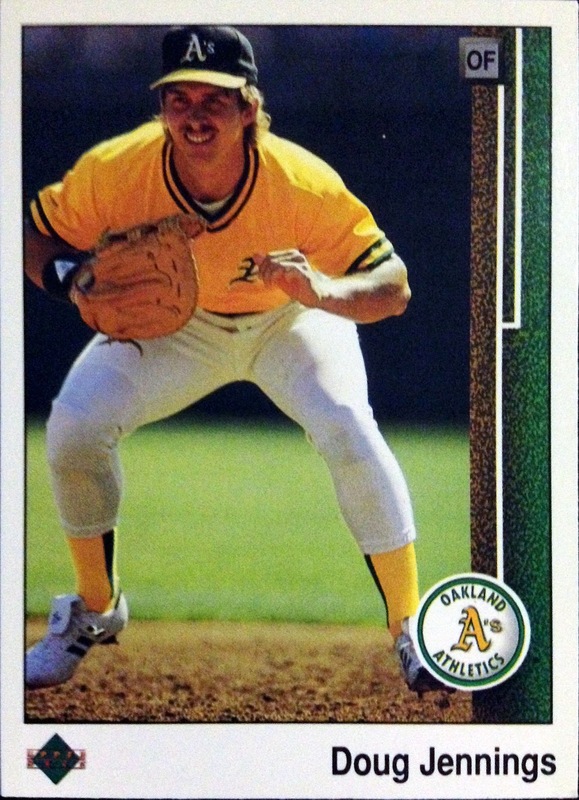 As a top prospect in the A's chain, Jennings rode the shuttle between Oakland and their top affiliate Tacoma from his initial call-up in 1988 through the 1991 season, never getting into more than 71 games or batting any better than an anemic .208. Needless to say, the brass in "the Bright Side of the Bay" eventually grew tired of waiting on Doug and gave him his walking papers. After a year playing in the minors again, this time for Baltimore, Jennings got his last taste of Big League baseball with the Cubs during the 1993 season. He was granted free agency that November. 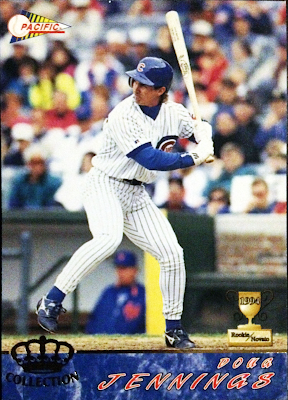 Besides the fact that Doug was clearly not a notable newbie by the time this card was produced, he had actually exhausted his rookie eligibility way back in the 1990 season, several years and two franchises before this card went to market. Of course, the folks behind this decision couldn't have just pulled up Baseball-Reference.com back then, though fact-checking is always a good idea. Oopsy-daisy. 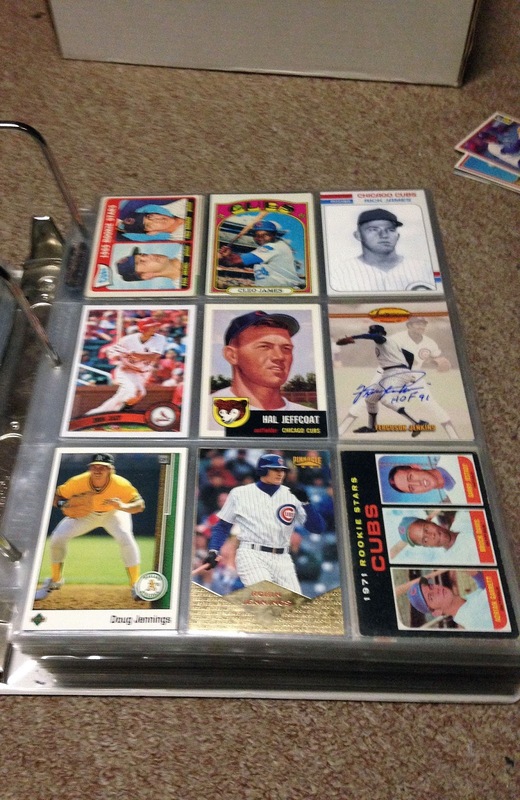 I guess you could say the same thing about me assuming that Doug never had a Cubs card... or that I didn't even bother to crosscheck the titular card with my CATRC binder... D'oh!! This isn't the first time I was able to add to my collection from within my own collection... heck, it wasn't even the second... or third. Anyway, my sloppy record keeping has allowed me to retrospectively add several new names to my CATRC over the years. Annoying though it may be, it makes for a nice little bonus surprise. I like to think of it as a karmic reward for finally sitting down and doing some organization - a can that I've kicked down the road time and time and time again. I'd also like to think that I'm not the only one who discovers cards previously thought needed hiding within their own clutches. Surely this is an experience that others on the blogosphere have experienced before? If so, please feel free to share in the comments section below - it may just make me feel a little less silly. In the end, if I've learned anything from this (and the year 2016, in general) it's to double and triple check your facts. Also, organization is an ally. Who knew? I've discovered a few errors and variations in my duplicate stash...I found every one when entering my trade list into the Trading Card Database. I never even noticed that Traks had spelled Musgrave as "Mugrave" and later corrected it in 1991. 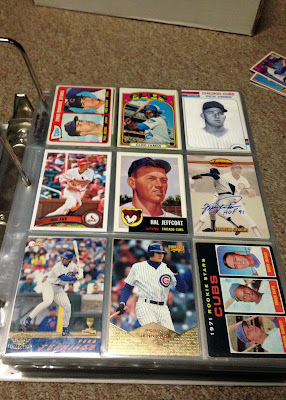 I've probably got most of the rest of the '94 Pacific Cubs if you want them. I actually uncovered the whole team set as part of my re-sorting, but I do greatly appreciate the offer! I've done this more than a few times with O-Pee-Chee cards... I see the picture on the front and think "Oh, just another Topps cards." 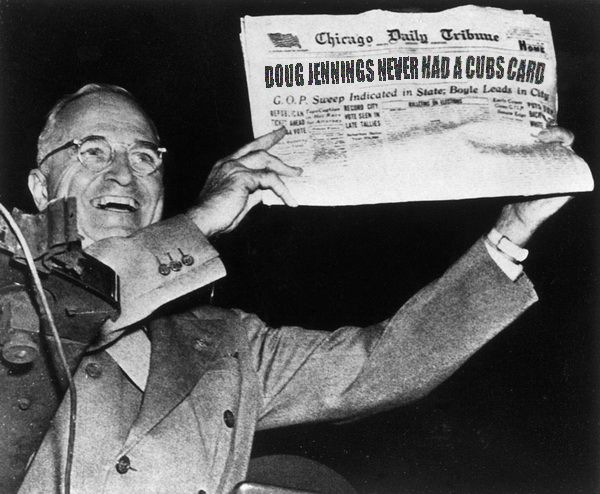 Doug Jennings had an interesting career. I didn't realize he was in professional baseball (of some sort) for over 20 years. That's pretty impressive even if he was "only" a AAAA player. Congratulations on finding the Jennings within your collection. I've been going back and forth... debating whether or not I should sort my team collections by card sets or by player (alphabetically). I'm leaning on doing it alphabetically. By the way... the photo Pacific used is far from pedestrian. I wish card companies would use more action shots w/limbs fully intact.